After a stay in flirtatious Libra, one of its home signs, Venus, the planet of values (what WE value and desire), love and finances, re-enters the “still waters run deep” sign of Scorpio on the 3rd of December. 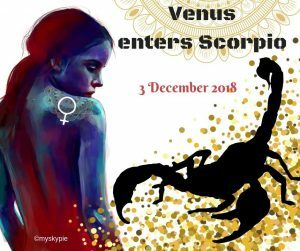 Venus usually spends approximately 37 days in each sign but due to its 42-day retrograde period (now ended) it will actually remain for a second bout in Scorpio until the 4th of January 2019. In Scorpio, Venus is in her mythical lover’s den (one of them, the other being in Aries). Venus in Scorpio can lend itself to uncanny ways of seduction with psychological abuse and mental cruelty not being unknown here. On the other hand it’s powerfully attractive and very passionate. Venus in Scorpio, as in Aries, is in her detriment where the planet is least at ease in its surroundings. continuing “what you value is a reflection of who you are so what we love is a reflection of ourselves”. Isn’t that a lovely way of conveying one of Venus’s meanings?